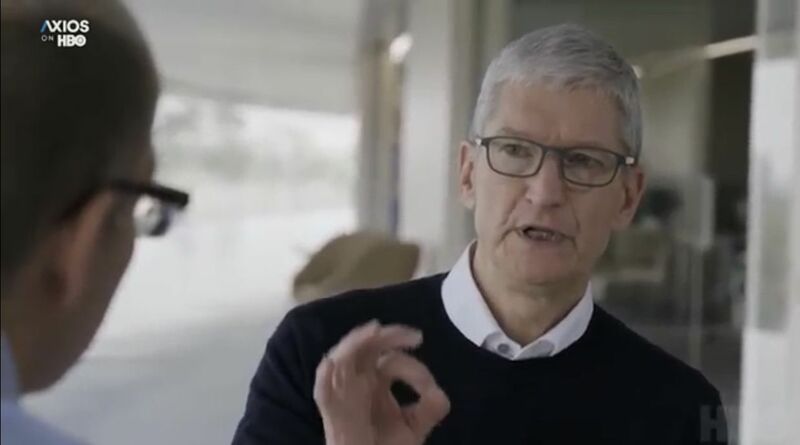 1 big thing: Apple CEO Tim Cook calls new regulations "inevitable"
CUPERTINO, Calif. — Apple CEO Tim Cook says tech companies don’t build products that are inherently good or bad, but should be aware that their products can be used for evil. 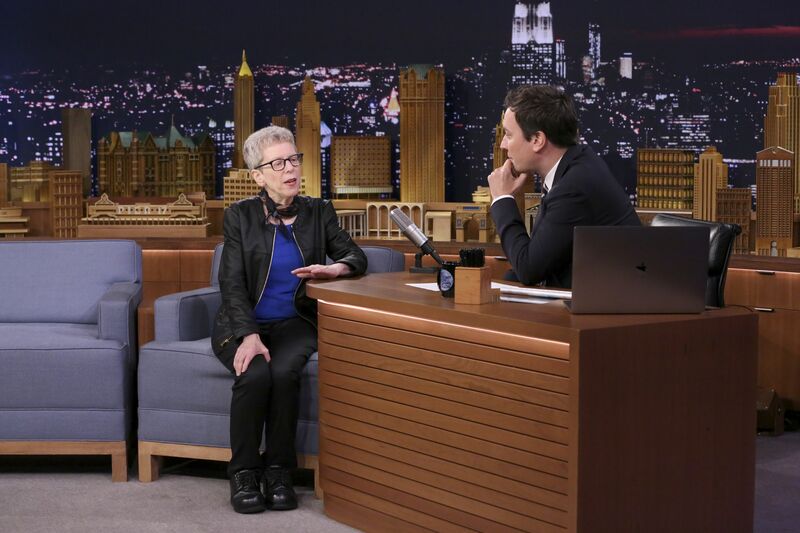 And he said in an interview with Ina Fried and me for "Axios on HBO" that new regulations are likely coming. "Generally speaking, I am not a big fan of regulation," Cook said in the interview, airing at 6;30 p.m ET/PT. "I'm a big believer in the free market. But we have to admit when the free market is not working. And it hasn't worked here." "I think it's inevitable that there will be some level of regulation," Cook added. "I think the Congress and the administration at some point will pass something." Why it matters: The CEO of the world's most valuable company made it clear that Silicon Valley, despite surging revenue and profits, is in a newly humbled posture after a year of rising global skepticism. Cook told us he used to pick up his iPhone too much, but has reduced his notifications: "The number of times I pick up a device are declining." "This is not a matter of privacy versus profits, or privacy versus technical innovation. That's a false choice." While acknowledging the Valley's male-dominated culture, Cook said that tech generally has been strong on diversity, and that he is "encouraged at this point that there will be more marked improvement over time." "I agree 100 percent from a gender point of view that the Valley has missed it, and tech in general has missed it." The backdrop: We talked to Cook during a rare visit by journalists inside the company's spaceship-like headquarters, Apple Park, which opened this year. The 13,000-employee, four-story building is arrayed in a ring that's a mile around and is mostly glass. ⚡️ Hear more from Tim Cook tonight on “Axios on HBO" (6:30 p.m. ET/PT). Plus: Our poll shows America souring on social media and an interview with NBA Commissioner Adam Silver. "[T]hose tensions burst into open warfare this past week after revelations that Facebook executives had withheld evidence of Russian activity on the platform for far longer than previously disclosed, while employing a Republican-linked opposition research firm to discredit critics and the billionaire George Soros." Why it matters: "Democrats now face a painful reckoning with longtime friends in the tech industry, relationships girded by mutual interest in issues like immigration and cemented with millions of dollars in campaign contributions." The revelations "reinforced criticism from the left — by Senator Elizabeth Warren of Massachusetts, among others — that Amazon, Facebook and Google are unaccountable monopolies, digital analogues to the railroad trusts of the Gilded Age." ⚡️ Tonight on "Axios on HBO": An exclusive poll by SurveyMonkey shows social media has big growing problems with both parties. Last night's call in California's last undecided congressional race marks "an epochal shift in a region long synonymous with political conservatism." 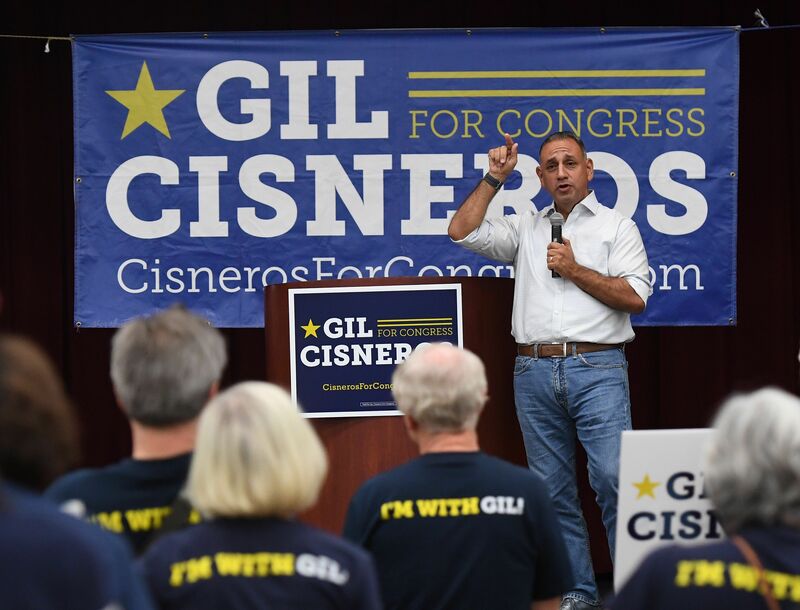 Fun fact: Cisneros, 47, is a Navy veteran and $266 million Mega Millions lottery winner who invested a chunk of his fortune in the campaign. Why it matters: "Democrats will constitute the entirety of Orange County’s seven-member congressional delegation, the first time since the 1930s that the birthplace of Richard Nixon, home of John Wayne and spiritual center of the Republican Party will have no GOP representative in the House." "Sitting back in the 1960s, I would never have believed this would happen," said Stuart K. Spencer, a party strategist who spent more than half a century ushering Republicans, including President Reagan, into office. 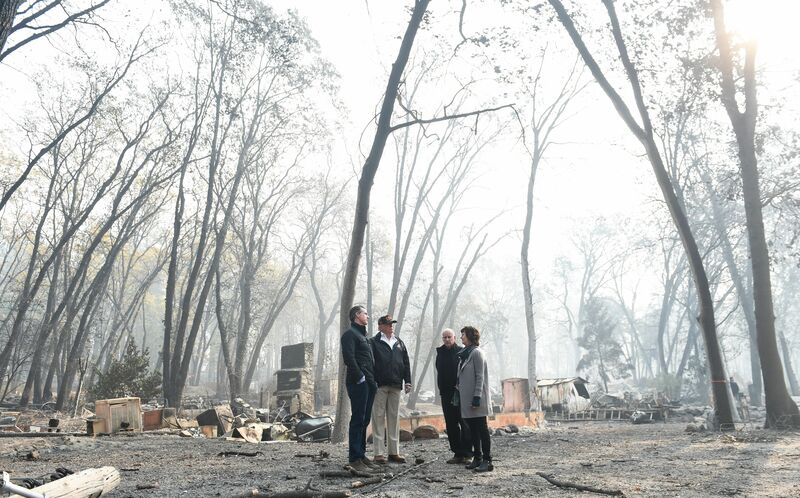 President Trump "toured the rubble of Paradise, where more than 12,000 structures were lost, with Gov. 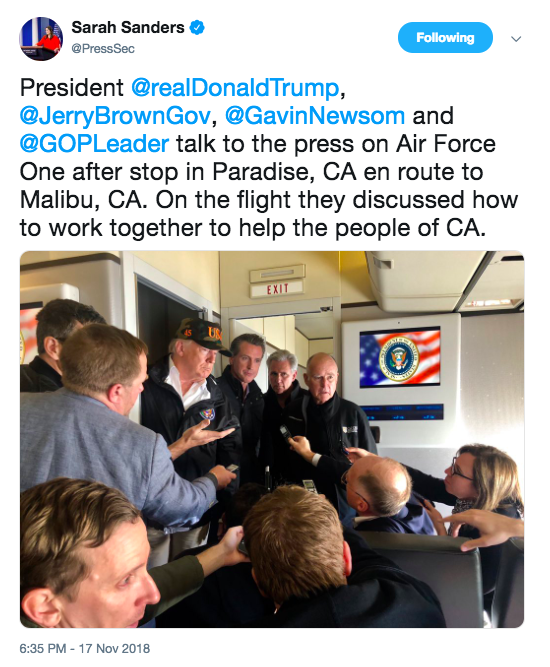 Jerry Brown and Gov.-elect Gavin Newsom." "Hopefully, this will be the last of these, because it was a really, really bad one," the president said. "People have to see this to really understand it." "We do have to do management, maintenance. We’ll be working also with environmental groups," Trump said. "I think everybody’s seen the light." Asked whether his views on climate change had shifted, the president said no: "I have a strong opinion; I want great climate." "This would be a very good time to do a shutdown. I don't think it’s going to be necessary, because I think the Democrats will come to their senses." 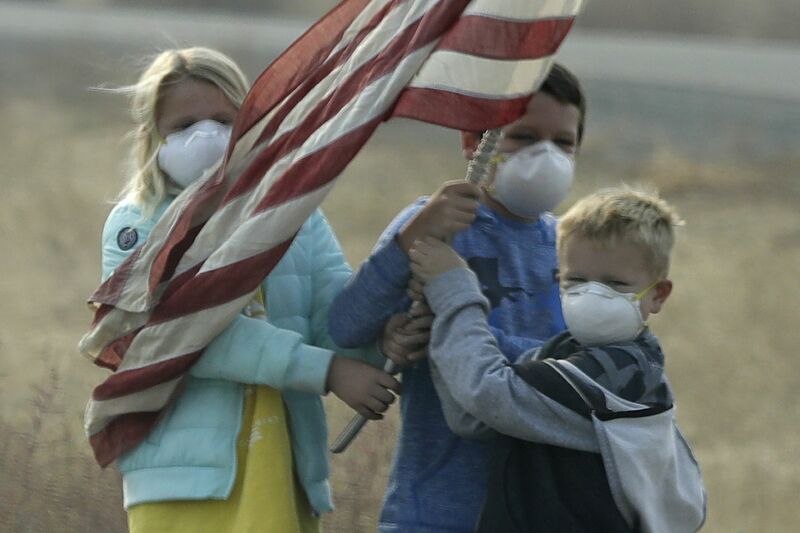 "And if they don’t come to their senses, we will continue to win elections. You know, we won the Senate. You do recognize [that], right? That means all the judges that I'm getting approved will now be easier." "While congressional leadership fights have historically revolved around insular matters such as committee assignments and rules changes, the battle over who will lead the newly empowered House Democrats has exploded into a national political campaign." 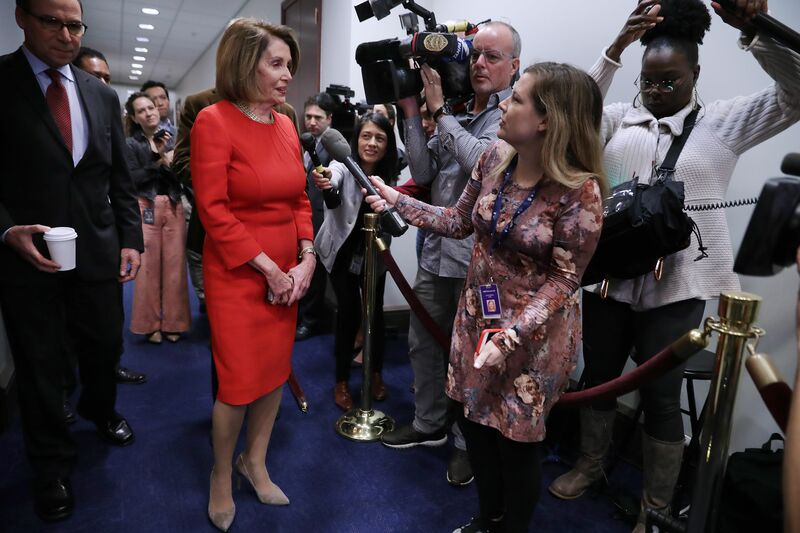 "Already the first woman to serve as speaker, Pelosi has said emphatically she will make history again and become the first lawmaker to reclaim the gavel since 1955 when the full House votes Jan. 3." Why it matters: "At stake is not merely the House speakership, a job second in line to the presidency, but who will emerge as the country’s most high-profile counterpoint to President Trump — who will set the strategy for investigating him, who will lead the opposition to his agenda, and who will be the face of the Democratic Party ahead of the 2020 campaign." "The battle lines have been drawn around identity, race and gender — issues that dominated this year’s midterm elections." "A potential challenge to Pelosi from an African American lawmaker, Rep. Marcia L. Fudge (D-Ohio), threatens to further divide Democrats." "In Michigan, ... Republican legislators want to water down a minimum wage law they approved before the election so that it would not go to voters and would now be easier to amend." 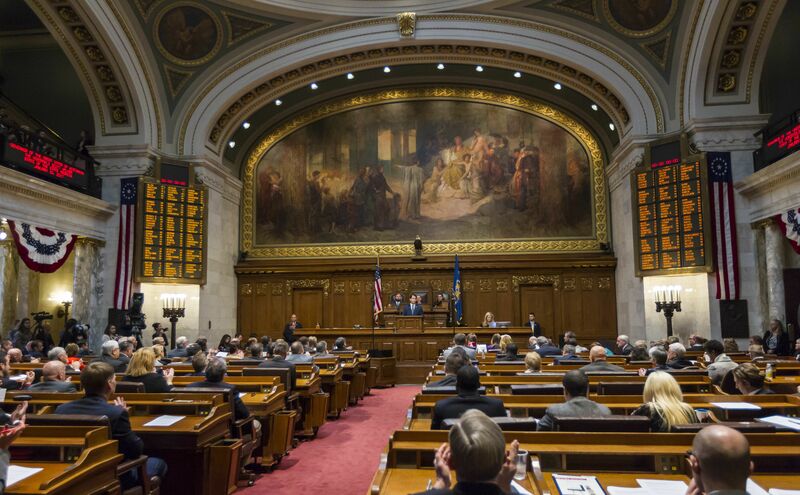 "Republicans in neighboring Wisconsin are discussing ways to dilute Democrat Tony Evers' power before he takes over for GOP Gov. Scott Walker." "And in North Carolina, Republicans may try to hash out the requirements of a new voter ID constitutional amendment before they lose their legislative supermajorities and their ability to unilaterally override vetoes by Democratic Gov. Roy Cooper." "Those are the only four words you need to navigate a potentially awkward conversation, whether on a blind date or at a cocktail party. Ms. Gross avoids asking more pointed questions (for example, 'What do you do for work?') that presume information to be true." "The beauty in opening with 'tell me about yourself' is that it allows you to start a conversation without the fear that you’re going to inadvertently make someone uncomfortable or self-conscious." 9. What Tinder learned from Uber: "Swipe Surge"
"During those periods, ... the odds of finding a match are increased. The test comes one week after Facebook announced testing of its competing dating product would be expanded." "Tinder says surges tend to occur on Monday nights ... The company also says that in some cities, like New York, surges may happen later at night than elsewhere." How it works: "When users choose to participate in a Swipe Surge, their profiles are placed at the beginning of the line, meaning other users swiping at the same time will see them first." "Participating people’s profiles will also have a special Swipe Surge badge, indicating they’re also currently looking for a match on their phones." "Swipe Surge essentially transforms Tinder into a real-time dating experience: Instead of waiting hours to find out if you matched with someone, the process is collapsed into what may amount to only several minutes." 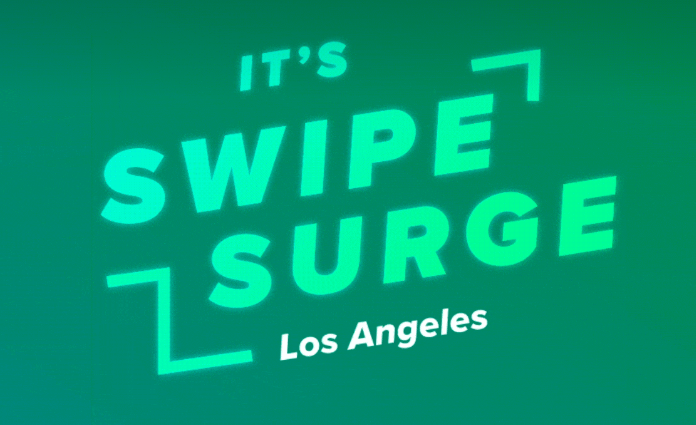 For now, Swipe Surge is only available on iOS in major U.S. cities. At his Copenhagen restaurant Alchemist, scheduled to open in January, Rasmus Munk "introduces extrasensory experiences that play out in a palatial dining room." "There will be four kitchens, 30 cooks, and seven dining spaces, all for one seating of just 44 diners per night (that’s one chef for every one-and-a-half diners)." "The space’s ­programmable LED panels will create a shifting landscape of cityscapes and snow and video works by artists. Munk says New York will be the introductory theme; expect graffiti imagery and Big Apple-inspired snacks." "Later in the meal, guests will find themselves under a planetarium-style ceiling in the main dining room." "Chefs will move like shadows in a kitchen hidden behind a frosted glass wall; ­others will work in the middle of the ­dining room. The action is focused on 20 one-bite courses tricked out with fragrance and other extrasensory garnishes."